Alex Jacob became the first player since Julia Collins to sweep an entire week. Will he win a seventh tonight? What a thrilling game this was, with both Alex and Todd making big True Daily Double wagers in the second round. Speaking of Julia, we’re just a few thousand short of the total amassed by her, Ben Ingram, and Arthur Chu in the first game of the last Tournament of Champions. If Todd doubles his score, he’ll have 36,800. 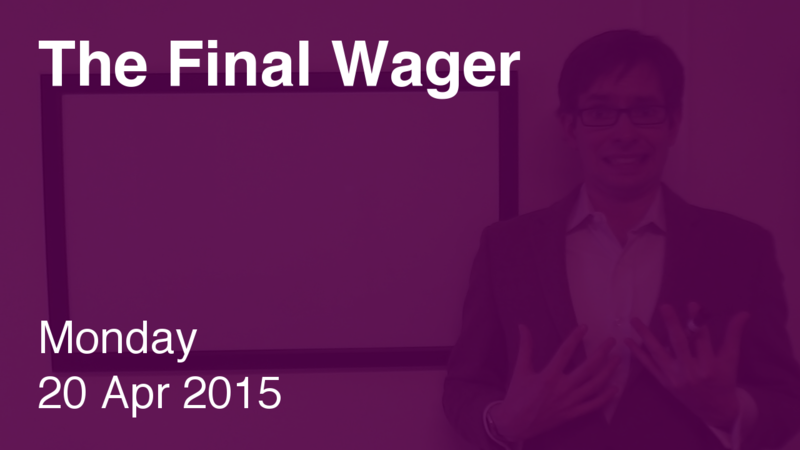 To cover this all-in wager, Alex will need to wager 10,400. An incorrect response with that wager will leave Alex with 16,000. To stay above his total, Todd can wager up to 2,400. Monica must respond correctly to have a shot, so all-in is the way to go. A successful doubling will put Monica at 19,200. To cover this, Todd should wager at least 800. Alex could wager at most 7,200. Just in case Todd goes for the 800 wager, Monica needs to go for at least 8,000 – still, all-in. If Todd makes the rational maximum wager of 2,400, Alex will need to wager 5,600 to stay above him. In that case, Todd would have to wager 13,600 and respond correctly. That’s another all-in wager if he’s scared that Alex isn’t playing to win. Monica’s wager makes no sense – she doesn’t even give herself a chance to win! The ol’ black wager for her. Todd gets a red because he’s not covering the small range out of Alex – plus, he left a whopping $10,399 on the table. Shame. I hear Sony Pictures Studios could use the money after its recent email issue. More analysis of Alex’s play coming up tomorrow.